So you have made that move, switched from a Windows machine to a new Mac. Maybe not you, but I did make that switch, and so far I have loved it. Loved it so much from an operating system and hardware standpoint I will not be going back. Making that switch though, you look for your familiar applications, what you use on a daily basis. Anymore a lot of items are universal, they make a version for Windows and a version for your Mac. There are a few out there still though that you need to find something similar. Some of them you may end up liking more. We'll go over a few of those apps that are different, and a few similar or the same. But I will share that switch experience with you all and give you some direction on where to point your browser. I’ll start by telling you I was a Pidgin enthusiast. I never got into the Trillian thing way back when, paying for a chat application is just freaking stupid to me. Having five or more different clients open at the same time is just a waste of resources when you can use Pidgin. I started back in the Gaim days and have not looked back. 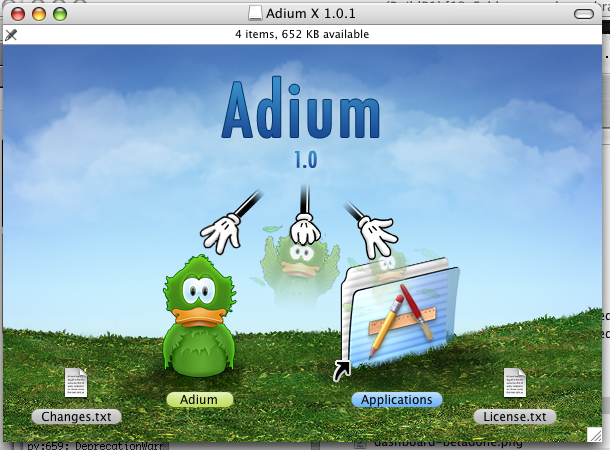 When I bought my Mac and spoke to my Mac buddy he told me Adium is the only way to roll, and no doubt he was right. It looks great, runs perfect, and does everything you need in a multiple protocol chat client. Twitter has become a guilty pleasure of mine. I used to be against it on all fronts. I saw no use in it until I figured out I can get all of my NFL news for my fantasy teams. I now follow all my sports news and my comic book news on a near constant basis. The iOS app for Twitter is perfect. That is where I got my start. I downloaded Tweetdeck on my Windows machine because everyone seemed to love it and carry on. It is a horrible pile of garbage in comparison to the app on the iPhone and same thing goes for the native Twitter app for OSX. Twitter on OSX is fantastic. Very similar to the version on the iPhone. Tweetdeck just did not look good and ran slowly. The Twitter app on OSX runs quickly and looks great. A freeware burning program I was told to use on the Mac was the program Burn. Personally I was a recent convert to the Imgburn software. I cannot say entirely one way or the other which is better. But everything I did with Imgburn works just as well and is just as easy with Burn. And it’s free of course. I hate paying for software. That hate brings me to which torrent application you like. I have been using utorrent on my Windows machine since the times before they had an installer. Just an exe you ran from a folder. The utorrent version for Mac runs just as well as it did on Windows. I continue to use it. Fantastic program on either operating system. I have heard some good things about the Transmission torrent program for the Mac, but I have not used it at this time, cannot give you my opinion. I still have multiple Windows machines at my house and I do need to do things on them from time to time. Control my file server or work on my girlfriends laptop. But I will be damned if I will get up and actually work on them. Screw that when VNC is out there. I have used Ultravnc extensively at home and at work for years. I checked around and found the best named VNC client of all time and one that works perfectly with the Ultravnc servers running on my network. Chicken of the VNC. It runs great, does all I need, and does not screw up. A couple of standout programs on the Mac are iPhoto and iMovie. Windows does not have a central built in photo program. All it does is let you import them to a folder. iPhoto has been fantastic for organizing my pictures. I love it. Same goes for iMovie. Although there is the built in Windows Movie Maker on Windows 7, it’s not good. iMovie is just polished as is everything with the OSX. I will say again I love that I made the change. It has been super smooth and fantastic. Never going back. Thanks for reading about this software that I have enjoyed in my transmission. Please check the facebook like box int sidebar.You have misplaced with facebook platform page instead of urs.